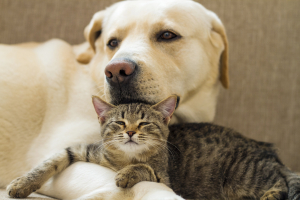 A national survey of 1,049 pet owners conducted by the American Animal Hospital Association indicates that the pet/human bond is stronger than most individuals would openly admit. 75% of dog owners and 69% of cat owners spend at least 45 minutes to more than one hour each day engaged in activities with their pets. 69% of dog owners and 60% of cat owners said that they give their pets as much attention as they would to their children. 57% said feline family members sleep with them, while 59% said their canine family members either sleep on, under, or next to, the bed. 76% of pet owners surveyed said they feel guilty occasionally or frequently for not spending enough time with their pets. 54% of survey respondents said they felt an emotional dependence on their pets. 55% and 46% of dog and cat owners, respectively, said they chose a human name for their pets.